Coast to Coast: What Is Going On with Russell Westbrook? This season has been a little bit of a struggle for Russell Westbrook. Although he is still averaging a triple-double (21.8 points, 10.6 rebounds, 10.6 assists) for the third straight season, the Oklahoma City Thunder point guard is clearly not the same player who won the league MVP two seasons ago. The most obvious drop-off in his game is his shooting. So far this season, Westbrook is knocking down just 24 percent of shots from three and about 66 percent from the free throw line. These numbers have been uncharacteristic compared to what Westbrook has put up in previous seasons. His shooting from mid-range also follows a peculiar pattern. Between 10 to 16 feet from the rim, Westbrook is shooting 32 percent, seven points lower than his career average coming into this season. But on longer two-pointers, he is shooting 39 percent, slightly higher than his career average. No matter which way you slice it, he is having one of the worst shooting seasons ever for someone who takes so many shots. Clearly, these woes are getting to his head. As someone who is taking an average of 20 shots per game and missing around eight of them, he is starting to hesitate. Before this season’s slump, Westbrook would have shot both of those in his sleep. But that looked like someone who was scared to shoot. Russell Westbrook isn’t supposed to be scared of anything. Some have speculated a knee injury that kept him out eight games earlier this season is still causing problems. Westbrook is no stranger to the operating table, having undergone at least four procedures on the same knee since 2013, when Patrick Beverley knocked him out of that year’s postseason. There is another potential reason for his poor free throw shooting. Before last season, the NBA made a rule change that stopped free throws shooters from taking too much time in between shots in order to speed up the game. Unfortunately for Westbrook, his routine ever since he was a kid was to walk to half court in between shots, which he can now no longer do. Like so many athletes, changing a routine, even one as basic as walking a certain distance, can impact performance. No matter what the issue is, I think the answer to Westbrook’s problem is pretty simple: stop shooting five threes a game, work on your free throws and keep getting the ball to Paul George. 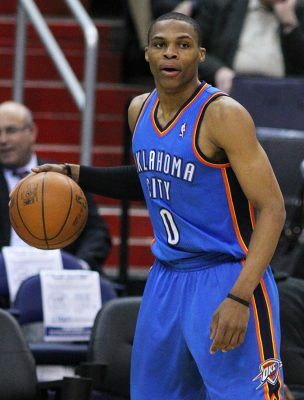 This season, unlike the past two years, the Thunder’s best player has not been number 0. Instead, small forward Paul George is having a career year and playing like an MVP candidate on both sides of the floor after deciding to re-up with the Thunder on a four-year deal this summer. George is averaging 27 points, 7.9 rebounds and four assists and guarding the other team’s best wing, which in the Western Conference is an All-Star caliber player almost every night. He is shooting 39 percent from deep and 45 percent from the field on the same amount of shots as Westbrook. George is someone who should be fed the ball on a consistent basis. He is playing like someone who can carry a team for long stretches of the game and still have enough in the tank to deliver in the end, like he did in Philadelphia on Jan. 19. That’s where Russell Westbrook comes in. Even though he’s putting up enough bricks to put Bob the Builder out of a job, he is doing everything else well. He leads the league in assists and steals, ranks fourth in deflections and still finishes at the rim at a solid rate. It’s not like Westbrook isn’t making elite plays on the floor anymore. Even the worst shooting slump of his career isn’t stopping him from infecting the team and crowd with intensity, something impossible to remove from his basketball DNA. Russ can still attack the rim and finish with ferocity better than any point guard in the league. He hasn’t forgotten how to accelerate from standing still at the three point line to zooming past late-arriving help defense for scores, like the second highlight in the clip. On the defensive end, Westbrook still takes possessions off. He lingers around the three-point line and just watches the action at times, but when he picks his spots to swipe the ball, it leads to nice and easy transition opportunities for the Thunder. Westbrook’s steals and deflections per game are part of the reason why the Thunder have one of the best team defenses in the league, but certainly not the only reason. Paul George is right up there, too, ranking one spot behind in steals per game, one spot ahead in deflections, not to mention his excellent on-ball perimeter defense. Between the two, they force 4.7 steals and 7.5 deflections a game. With a starting lineup that includes a versatile defender in Jerami Grant, a bruising center in Steven Adams and a young wing defender only getting better in Terrance Ferguson, the Thunder are keeping points off the scoreboard. That starting five yields just 96.6 points per 100 possessions, which only the Grizzlies (92.3 DEFRTG) and Jazz (95.9 DEFRTG) can match. As long as Russell Westbrook is on the court, he can be the ultra complementary point guard for Paul George. He just needs to pull back on the reins when it comes to shooting the ball. If OKC has any chance of making it to the second round of the playoffs for the first time since Kevin Durant left, Westbrook cannot play the same as he did in the past, even if it did earn him MVP honors. With Paul George and MVP Russell Westbrook, the Thunder can be a really good team that goes home after the first round. With MVP Paul George and a Russell Westbrook that focuses more on slashing to the rim, moving the ball and playing consistent defense, the Thunder can make a run at the NBA Finals.